So far, university presses as a whole haven't been too aggressive in developing creative eBook plans for their catalogs and backlists. Judging from this, and the pricing models that many have adopted for current releases, there appears to be significant fears of cannibalization of hardcover sales. Out of print rarities, of which there are many, might be usefully revived through eBooks, but I have no idea of the cost and difficulties (or the rights issues) surrounding the taking of pre-digital era academic books and converting them into professionally presented eBooks. However, UNC Press has launched an interesting program that offers parts of books. This could be a useful and profitable way to sell, for example, single chapters from an essay compilation. I am less certain in my feelings about their packaging large excerpts from narrative histories, unless they make very clear what they've done. For instance, they are now offering a 332 pp. excerpted eBook edition of the battle history part of Rable's Fredericksburg study. I don't own a copy to check, but I seem to recall that less than 100 pages from this tome were devoted to the traditionally rendered battle history section, so there are definitely significant amounts of other-themed material included. Hopefully, the press consults with the author(s) on these matters, because one can certainly alter the tone and thrust of a narrative work with this kind of editing. They are also offering appropriate collections -- such as the Earl Hess eastern theater field fortification trilogy -- in a single eBook. You can see all this for yourself here. Around the web, David Woodbury has commented positively on this development, as well. Clearly the intent of The Battle of Pea Ridge: The Civil War Fight for the Ozarks cannot be to replace Shea & Hess's masterpiece, but I liked the author's synthetic Franklin work enough to want to read his perspective on Pea Ridge. Wittenberg: "THE BATTLE OF WHITE SULPHUR SPRINGS: Averell Fails to Secure West Virginia"
The U.S. cavalry raid that culminated in the August 26-27, 1863 Battle of White Sulphur Springs was conducted for a curious reason, the hoped for seizure of the law library at Lewisburg, the legal possession of which was claimed by the new West Virginia state government. For their part, the Confederates mistakenly assumed the raid was yet another attempt to sever the vital Virginia & Tennessee Railroad and disrupt the region's salt works. Cavalry historian Eric Wittenberg's The Battle of White Sulphur Springs is a complete history of this raid, with a concluding section examining preservation issues surrounding the battlefield. The Union force that was defeated at White Sulphur Springs, a new and understrength brigade of recently mounted West Virginia regiments (plus the 14th Pennsylvania Cavalry), was led by the experienced raider Gen. William Woods Averell. This command, designated the Fourth Separate Brigade, left Winchester, Virginia on August 5 and traveled southwest, where a supporting force from Beverly hooked up with it near Huntersville, where the new arrivals would serve as Averell's rear guard. The raiders continued east to Warm Springs before turning southwest toward Lewisburg, in Greenbrier County. Meanwhile, the Confederates were not idle. Although Col. William L. "Mudwall" Jackson did little to hinder Averell before or after the White Sulphur Springs battle, a Confederate infantry brigade under the temporary command of Col. George S. Patton intercepted the raiders at a rugged mountain pass just outside White Sulphur Springs. Averell was defeated in a sharp fight, but was able to skillfully retrace his steps to ultimate safety. Wittenberg is clearly an admirer of W.W. Averell, at the very least believing him to be an underappreciated and unfairly maligned Civil War figure. In his book, he lauds the New Yorker's ability to quickly mold disparate elements into an effective raiding force, one that would go on to perform well on other Civil War fields. Although the case presented in the book did not strike this reader as particularly persuasive, the author considers Averell to be the Union's premier cavalry raider. However, with a full comparative investigation of Averell's raiding career lying beyond the scope of the book, a more in depth defense of this claim might make for an interesting magazine article by Wittenberg. Several Confederate officers are also singled out for praise. Modest in his assessment of his own role in the battle, Patton was instrumental in engineering the Confederate defensive victory. Lt. Col. Walter Edgar is also rightfully commended for his successful pressure-packed handling of Patton's center. The author's description of the raid's origin, together with his biographical sketches of the regiment, battery, and brigade commanders from both sides, provide readers with a solid background into prominent people and events surrounding the raid. The book's tracing of the raid path, and its summarization of the Confederate attempts to block and cut off the invader, are equally good. Of course, the detailed tactical account of the Battle of White Sulphur Springs comprises the heart of the book, the skillful construction of which is probably second nature to the author at this point in his extensive military historical writing career. The action unfolds at regiment and battalion scales, and the important roles played by the artillery of both sides are noted. The confining nature of the terrain is described well in text (as well as amply demonstrated visually by a set of excellent maps created by Steven Stanley), with the rugged high ground on both flanks precluding turning movements. With few better options, the battle played out as a series of back and forth frontal attacks. For its size, the Battle of White Sulphur Springs was particularly bloody, and it is certainly unusual for a cavalry raid to experience a sanguinary two-day fight over the same ground. Like all large collections, the Civil War Sesquicentennial Series battle histories published by The History Press vary in depth and quality, and The Battle of White Sulphur Springs is among the very best the series has to offer. The research, maps, and writing are exceptional, and the volume's long term value is certainly enhanced by its stature as the only book length study of the subject. Author Eric Wittenberg is to be commended for significantly raising the profile of this obscure raid and battle. 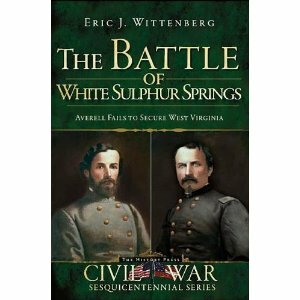 His Battle of White Sulphur Springs is highly recommended reading for all students of the war in West Virginia. Donald Frazier is a professional historian and head of the Grady McWhiney Research Foundation. He has authored or edited Cottonclads! : The Battle of Galveston and the Defense of the Texas Coast , Blood & Treasure: Confederate Empire in the Southwest , and Love and War: The Civil War Letters and Medicinal Book of Augustus V. Ball, and he is currently at work on the third of a four volume history of the Civil War in Texas and Louisiana (which he informally refers to as his "Louisiana Quadrille"). The first two books, Fire in the Cane Field: The Federal Invasion of Louisiana and Texas, January 1861-January 1863 and Thunder Across the Swamp: The Fight for the Lower Mississippi, February-May 1863 have been well received here and elsewhere. This series and the publishing arms of the GMRF are the subject of the following interview. CWBA: Thanks for joining me. As the President and CEO of the Grady McWhiney Research Foundation, are you involved in the day to day operations of State House Press/McWhiney Foundation Press? DF: I am. Heavily involved. I’ve done everything from raise funds to design books. I certainly supervise the work-flow. As far as the nuts-and-bolts of State House Press, our publishing process follows a typical academic press pattern. Submitted manuscripts are reviewed by a rotating editorial review board (currently Ty Cashion, Sam Houston State University; Charles Grear, Prairie View A&M; Stephen L. Hardin, McMurry University; and Anne Bailey, retired from Georgia College and State University; and Robert Sledge, retired from McMurry University). This august body reviews the submissions, winnows out the fiction, poetry, and other genres we don’t publish, then evaluates the rest for suitability given our market reach and areas of emphasis and expertise. Some of the criteria they use is marketability, commercial viability, scholarly importance, natural markets, author involvement, and shelf life. The manuscripts that we believe to be best suited for our list are then sent out to readers in appropriate fields to get them to render an opinion on the suitability of the offering along with any remarks they might have about revisions or even rejection. The good news is we have a double blind review process. The better news is we can render an opinion fairly rapidly and are unencumbered by academic fads. Just like the old days, we let the marketplace influence what we sell. There are plenty of university presses out there to publish esoteric studies of limited interest to the general reading public. One of the biggest projects to come along is a book by former Genesis front man and recording star Phil Collins. Turns out he is a huge Alamo fan. Here is a link to a video about that project. I also teach at a small liberal arts college, McMurry University, and have been involved is spinning up a new program, The Texas Semester. Here is that website. Tons of stuff to do in the history business; I haven’t even mentioned the various museums I am involved with. We are part of the Texas A&M University Press Consortium. We get all the good of this academic press association, but don’t have to suffer a lot of the bureaucratic and academic nonsense that comes with it. In the end, our books will either sell to interested readers, or they won’t. We are not subsidized by the state or any other entity. We are free enterprise. When I publish with State House, I am taking the same risk I am asking my other authors to take. We live by donations and books sales—not by being a line on a government budget. CWBA: The publication of Jeff Patrick’s excellent Wilson’s Creek study marked a long period between Civil War Campaigns and Commanders series releases. Are there plans to increase the output of this series during the Sesquicentennial? DF: Our Campaigns and Commanders Series has had a mixed history. For every big seller like Jeff Patrick’s, there are a half dozen languid sellers. For instance, I think Shea’s book on Pea Ridge and Prairie Grove is one of our best, but sales are sluggish. Our book on Hood at Atlanta, Sherman’s March, Raphael Semmes, and the Battle of Mobile are all well written and stirring tales. Yet, we can’t move them like I would like. At the same time, we are competing with the Park Service series (my tax dollars at work) and presses at state-subsidized universities and they are much better funded. At the end of the day, then, we have to publish books that we think have a chance at actually selling somewhere before we will take the risk. For instance, we have no titles for sale at the Gettysburg Visitors Center even though we have titles that would be appropriate. That said, we also have not had recent submissions to the series. We had one on Sumter that went back to the author for revision and that was never heard from again. I also had the promise of a submission on Gettysburg, but it also vaporized. So, there really isn’t much to offer at this point. It’s a shame. I like our series of approachable history books. On the other hand, we are publishing the edited diary of an officer aboard a steamboat contracted to the Confederates on the Arkansas and Mississippi rivers. We also have a promising manuscript on prostitution in the Civil War. CWBA: In addition to Patrick's, I also really like Richard Lowe's 1863 Texas Overland Expedition contribution to the series. Getting to your “Louisiana Quadrille", if I recall correctly (and please correct me if I am wrong), the project began as a two-volume history of the Sibley Brigade. Can you describe how the series evolved and how you integrated your more specialized original concept into a broader study of the war in Texas and Louisiana? DF: Actually, in graduate school at TCU, I set out to do a one volume muster in-to-muster out history of Sibley’s/Green’s brigade. However, some of my fellow McWhiney Seminar colleagues challenged me to think differently about these campaigns and operational history in general. They wanted to know WHY these guys were joining, heading to New Mexico, heading to Louisiana, and fighting at Galveston. Not just in a troop movement sort of way, either, but in a broader sense like where it all fit in the context of that time and place. Why did these guys go? Why New Mexico? Why Louisiana? In hunting these answers, the material grew and expanded and different sorts of theses emerged. In the end, I wanted to write a book that answered these lager questions, and at the same time did right by the men who suffered through this conflict in these exotic fields. In order to get their story told—and the larger story told—I had to break it up. Blood and Treasure was the first offering, followed by the Louisiana Quadrille. CWBA: Charles Grear recently addressed similar concerns with Why Texas Fought in the Civil War (TAMU, 2010). The scope of the Quadrille series volumes increased substantially between Fire in the Cane Field and Thunder in the Swamps – the former a relatively brief overview of a two-year stretch of time and the latter a massive, minutely detailed microhistory dealing with a much shorter period of a few months. From a reader’s perspective, the delay in the release of Volume 2 in order to deliver a definitive level treatment of the 1863 Bayou Teche Campaign was certainly worth the wait. How did that change come about? DF: Sources and scope determined the lengths. Fire in the Cane Field was a shorter book about a longer time because there were fewer players and the movements were more easily handled in broader strokes. The fights were fairly straight-forward, and brief. The sources less concentrated as well. In Thunder Across the Swamp, there is a lot of operational history to talk about, and tons more sources to support it. In addition, I needed to put the rather complicated campaign into the context of the Mississippi Valley Campaign—from both Northern and Southern angles. The book is probably 150 pages longer that it might have been otherwise because of all the maps and the images. As long as I was doing a book on the topic, I wanted it to be comprehensive in terms of all the visuals that I could put together for it. CWBA: Did your expansive transformation of Vol. 2 affect your plans for 3 and 4? Will the content of the final two volumes remain the same? DF: No idea. The war in Louisiana gets remarkably complicated in 1863, and not only will I be dealing with smash-mouth operational history, but also with the evolving policies surrounding the raising and deployment of Black troops. Then, there is a bloody and ugly guerilla war as a constant undercurrent. There are a lot of moving parts to consider, and watching Louisiana bleed out in the summer and fall of 1863 is heartbreaking. The sources will dictate how extensive a bunch of this gets covered. I will constantly have to fight the urge to follow rabbit trails that I might find interesting but that don’t necessarily advance the thesis. One thing is for sure: I like plowing new ground, but grubbing stumps is hard! CWBA: No serious full length 1864 Red River Campaign battle histories exist, and, among the large number of campaign summaries that have been written, none really represent a significant upgrade in depth and breadth to Ludwell Johnson’s classic study [although Gary Joiner has done excellent work on the naval and hydro-geography of the campaign]. How do you plan to address the campaign in your series? DF: Well, I think the reason that is the case is because during the centennial, folks wanted to write about big splashy campaigns with lots of drums and bugles. However, all of the armies that fought up and down Red River had a past—as I am discovering, a pretty interesting and extensive past. I will probably be one of the few people on earth who will have followed many of these stories for the entire length of the war, and I suspect that nuance will suggest plenty new to say. When you throw the states of Texas and Louisiana in almost as characters in the story, it makes for a richer story, I believe. It certainly delivers a great deal of context. Readers who hang with me through all four volumes will leave, I hope, with a deeper understanding of the subtleties, undercurrents, and rawness of the nation’s great tragedy. I am a huge Gary Joiner fan. I think his understanding of the hydrography of the Red River Valley is revolutionizing how we look at this part of the world and its role in the Civil War. I rely on his path breaking work a lot. CWBA: You create the maps for your own books, as well as lending your services to other authors. How did you get into cartography? DF: I needed maps in graduate school. I played Avalon Hill war games as a kid, and learned early on that in many ways geography was destiny. It is the canvas upon which the history is painted. When I needed maps, I discovered that it was easier for me to become a graphic artist that it was for me to train a graphic artist in the arcane ways of the historian. I’ve subsequently created more than 2000 maps for scores of publishers on a huge variety of subjects--everything from the extent of prairies in North America at the time of European contact to present-day firefights in eastern Afghanistan. It has made me something of a historical polymath because I learn a whole lot about a great number of things. CWBA: Thunder Across the Swamp has almost 60 maps, an extraordinary amount given the increasing neglect of even minimal levels of cartography in Civil War publishing. Have you found drawing your own maps essential to getting the number and quality of maps you need? Do you have a philosophy of mapmaking and the relationship of cartography to military history? DF: Maps are vital to military history. If I had published with anyone other than State House Press, I would have been limited to far too few. I would have charged a customer between $5,000-$6,000 for that extensive of a map program. However, I consider my cartography to be part of my scholarship. I guarantee that having to rebuild the land forms and human geography that influenced the history I am writing is as difficult a chore as any part of the research process. In addition, I have discovered that the ability and capacity to do geographical research oftentimes changes, or certainly influences, the writing of the historical narrative. CWBA: In your opinion, what are some important aspects of the Civil War in Louisiana and Texas (military history or otherwise) that remained neglected by the literature? DF: Well, one thing I would love to see someone work on is the toll the war took on civilians and non-combatants. I would love a good old fashioned number crunch analysis on property damage, lives lost due to famine, brigandry, and exposure as a result of the war. In Louisiana, I am especially intrigued by the numbers of Africa-American dead as a result of the bewildering consequences effects of emancipation, conscription, and freedom. Freed slaves suffered. There are also some political tones that I wish I could hear more clearly, but I will never voluntarily get dragged into an extensive study of Louisiana politics. I’d rather learn how to make my own Boudin Sausage than that. On the Texas side of the Sabine, I have been intrigued by the political and economic “middle course” the Lone Star State seems to steer. I bet if we look hard, we will discover many a Texan growing happy and comfortable by trading with US agents. I’ll have to brag on a former student—Chuck Grear. He was sitting in my office at McMurry when we got to talking about WHY Texans fought in the Civil War. He went on to make that into a well respected book. So, in answer to your question, I am always happy to pass along research ideas to fellow travelers. CWBA: Thanks for participating in this interview, Don. When might we see Vol. 3? DF: Here’s hoping for 2013. There are a lot of great characters and stories to develop. In addition, I am considering a new approach in this volume, Blood on the Bayou. The sources for the next two volumes are probably only 20% different that those used in Fire and Thunder. I wonder if, instead of grinding feverishly on the footnotes, I instead lightened up on the footnotes and had source essays for each chapter. In many ways I think that a good cogent essay about where the sources are, and their context, might be more useful to future scholars than the more mechanical source-and-page format I do now. Clearly I want to note direct quotes, but I find myself typing “ibid” a lot. That seems kinda goofy to me. In addition, footnotes get chewed up when the books go digital for Kindles and iPads. What advice would you or your readers have for me? One thing is for sure: I need to get it done. I should get a year-long sabbatical in 2013-2014. I’ll need every day of it to do right by the Red River Campaign in the last of the Louisiana Quadrille. I may have developed a bad habit of taking on very ambitious projects. CWBA: Well, I do think a really well done scholarly bibliographical essay can be a fascinating and immensely useful feature of a book, but I would have a rough time with giving up the traditional citation method entirely. This is very rarely encountered, but I always like it when authors employ both -- notes and a source essay at the end -- but that doesn't help you simplify things! 1. The Massachusetts Andrew Sharpshooters: A Civil War History and Roster by Alden C. Ellis, Jr. (McFarland, 2012). Everyone knows about Berdan's Sharpshooters, but I recall during my Peninsula Campaign order of battle research coming across several company-sized sharpshooter units that I'd never heard of before. The Andrew Sharpshooters from Massachusetts was one and now they have their own complete history and roster. 2. "Bully for the Band! ": The Civil War Letters and Diary of Four Brothers in the 10th Vermont Infantry Band by Charles George, Herbert George, Jere George, and Osman George; edited by James A. Davis (McFarland, 2012). As a corollary to an earlier post about book releases timed to Sesquicentennial battle anniversaries, it should also be mentioned that Blue & Gray magazine just released a new issue covering the February 1862 campaign against Forts Henry and Donelson, as well as later clashes at Dover, Tennessee. The series of maps in it are superb, showing regiment and battery positions at various phases of the Donelson battle, as well as the terrain. B&G cartography associated with the main article and General's Tour often exceeds in quality and number anything found in book length studies, and this is the case here. When B&G issues revisit battles after a long gap in time, they always make it worthwhile with stupendous improvements in article content and map graphics. 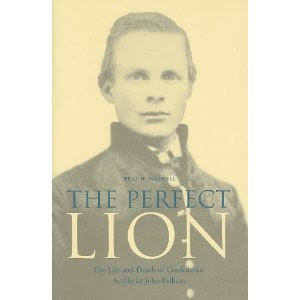 "The Perfect Lion: The Life and Death of Confederate Artillerist John Pelham"
Civil War battery commanders are not often the subject of thick biographical tomes, but few would argue that John Pelham is undeserving of the honor. A handful of books trace the short life of "The Gallant Pelham", but John Maxwell's The Perfect Lion should be regarded as the first and only truly scholarly full length biography. Raised on a large Alabama plantation, John Pelham went to West Point for his education, where he resigned and returned home on the cusp of graduation. As a Confederate battery commander in Virginia, Pelham's abilities caught the attention of his superiors, ensuring his rise would be rapid. Major Pelham reached his greatest fame as commander of JEB Stuart's horse artillery battalion. Maxwell recounts in fine detail the pair of battlefield performances that comprised the signature moments of the Alabamian's brief but illustrious Civil War career -- his skillful direction of Stuart's artillery enfilading the Union right flank from Nicodemus Hill at Sharpsburg and Pelham's even more famous handling of a pair of guns on the Confederate far right flank at Fredericksburg. As Maxwell demonstrates, in addition to his substantial tactical acumen, personal bravery was the hallmark of Pelham's conduct under fire. While many modern biographers find that truth and myth often intersect only obliquely if at all, Maxwell's dutiful examination of the evidence finds that Pelham's career was one of those rare ones that fully lived up to the hype. Tragically, Pelham could be a bit too impetuous at times, and the 24-year-old officer was killed by a federal shell fragment while charging the enemy at Kelly's Ford in March 1863. Maxwell's depth of research is exemplary, and the level of detail and analysis present in his narrative should fully satisfy even the most demanding Civil War students. My only complaint is a minor one pertaining to the maps. While they do trace the position of Pelham on various battlefields in general terms, and are present in sufficient numbers, one might have wished for a more close-in scale. Again, this is only a minor quibble. The Perfect Lion completely blows away all previous efforts, worthily assuming the mantle of the standard biography of John Pelham. Every student of the operations of the Confederate long arm in the eastern theater during the first half of the war, especially those most interested in Stuart's horse artillery, will benefit substantially from reading this volume. 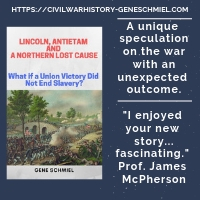 Obviously, attention surrounding the Civil War Sesquicentennial provides a good opportunity for publishers to schedule new campaign and battle history releases for their corresponding war year. I'll admit to being quite disappointed that no serious First Bull Run monograph, among other things, emerged last year, but let's see what 2012 might and might not bring. It would probably be unnecessary to attempt to supplant Rick Sauers's history of Burnside's NC expedition, Hennessy's 2nd Bull Run classic [although Scott Patchan contributed an excellent supplement in '11], or the Noe & Hafendorfer and O'Reilly & Rable double teamings of Perryville and Fredericksburg. I am also more than satisfied with what we already have for Forts Henry & Donelson, Pea Ridge, Island No. 10, the Shenandoah, Cedar Mountain, Iuka & Corinth, Prairie Grove, and Stones River. I've yet to hear even a rumor of anyone working on a new history of the fall of New Orleans, or anything from 1862 Trans-Mississippi operations. A Seven Days overview is scheduled for this year, but no news obtainable by me is currently available for any of the Peninsula battle histories that are supposedly in process. Brian Jordan's South Mountain book should be something to look forward to, along with the Antietam campaign atlas from the same publisher, but I have no idea if Scott Hartwig's first of two Maryland campaign volumes is expected in 2012. Given the neglect by all Shiloh histories of a rendering of second day events comparable in detail to the first, there is still ample room for a definitive Shiloh battle history. Unfortunately, with Peter Cozzens giving up the attempt, and the 2012 Woodworth and Groom books not of the sort, it appears the opportunity will be lost. If Timothy Smith covers the "siege" in some detail, the freshest entry of the year might very well be his book length examination of Corinth's military role in the war. A new examination of the 1862 portion of the Vicksburg campaign [Sherman's riverine right hook to Chickasaw Bayou and Grant's overland advance] does not appear to be on the horizon. Of course, 2012 has only just begun and all of this may change when the Fall '12 catalogs come out this summer. Moody: "DEMON OF THE LOST CAUSE: Sherman and Civil War History"
Although one can construct a strong argument for Nathan Bedford Forrest being the most controversial figure to emerge from the American Civil War, Wesley Moody's Demon of the Lost Cause offers up a worthy candidate in William Tecumseh Sherman. In it, Moody traces the Union general's reputation from the end of the Civil War to today along two main lines of inquiry, Sherman's alleged place as a prophet of modern warfare (ex. his employment of the indirect approach) and his wholesale targeting of civilians via "total war." Though these ideas are accepted history among the general populace, most readers of serious scholarship have probably discarded both notions by now. One need only take a short look in the rear view mirror of Sherman's campaigns at U.S. Grant's Vicksburg and Winfield Scott's Mexico City campaigns to see that Sherman was no great operational innovator. On the second point, it is clear from the evidence that the level of destructiveness inflicted by Sherman's armies in Georgia and the Carolinas has been greatly exaggerated in the popular imagination, although we must be careful not to go too far in the other direction. Moody himself is guilty of this at times. Moody begins Demon of the Lost Cause with the interesting argument that Sherman was actually a popular figure in the South during the first two decades post-Civil War. Sherman shared many of their views on race and politics, and clashed with the federal government over some Reconstruction policies. The demonization of the general really began with the ensuing generation and the creation of the Lost Cause mythology. Added to this were criticisms published by fellow Union generals with axes to grind like Henry Boynton and John Schofield. A later chapter summarizes the Lost Cause influenced depiction of Sherman in film. In the final section of the book, modern historians fall under Moody's critical pen. Michael Fellman is taken to task by Moody for not being sufficiently critical of the Lost Cause interpretation of Sherman's destructiveness. British army veterans B.H. Liddell Hart and J.F.C. Fuller (especially the former) are criticized for inflating Sherman's reputation as a modern military theorist, but also for viewing his brand of warfare as a harbinger of the death and absolute ruin that twentieth century war would inflict. The problems of Demon of the Lost Cause are twofold. While his defense of Sherman is accurate in general terms, the brevity and lack of depth associated with Moody's arguments will make it very difficult to convince detractors. A great deal of ground is covered in 150 pages of narrative, and too many assessments are rendered in sound bite fashion. The notes, simple source recitations lacking explanatory features, do not help either. The other weakness is in the research. The bibliography is limited to a run down of basic Sherman historiography (mostly books authored by historians and contemporary generals and politicians), supplemented by newspapers. While it very well may be true that Sherman was popular in the South in the two decades after Appomattox, the evidence provided is sparse and very selective. The voices of what we might call 'typical' southerners are essentially absent from consideration for this period. That said, the above comprise rather typical features of brief works of synthesis. While Demon of the Lost Cause is not a great work of breakthrough argumentation, it does provide readers with a solid representation of the creative background of the Sherman mythologies. It also effectively frames and highlights important points of contention that require reevaluation in order to foster a better understanding of William T. Sherman and Civil War history. My list of favorite books from 2011 by category. I've also added a page tab for 2012 books that I am especially looking forward to reading. "The Artillery Service in the War of the Rebellion, 1861-65"
Having commanded a foot battery, a horse battery, a heavy artillery regiment, and the II Corps artillery during the Civil War, distinguished army artillery school superintendent John C. Tidball was highly qualified to write a critique and history of the long arm of the Union. 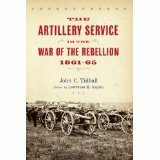 Edited by Lawrence M. Kaplan, Tidball's The Artillery Service in the War of the Rebellion, 1861-65 (Westholme, 2011) is a compilation of essays and unpublished material written by Tidball in the late 19th and early 20th centuries. The essays cover both major theaters [Peninsula, Antietam, Fredericksburg, Chancellorsville, Gettysburg, and Petersburg in the East, and Shiloh, Stones River, and Chickamauga in the West]. Largely organizational in focus, the materials note the key role played by the big guns in each battle. Tidball also generously highlights the distinguished services of lesser known battery and battalion level commanders. The progressive solving of early problems, such as dispersal of batteries and insufficient rank for the leadership of the arm, is traced. Historian Kaplan deserves a lot of credit for rescuing these writings from obscurity, compiling and editing the essays and manuscript material into readable format, but the lack of annotation holds the book back from being regarded as a definitive edition. Nevertheless, the intrinsic value of the writings is considerable and outweighs the absence of scholarly editing. 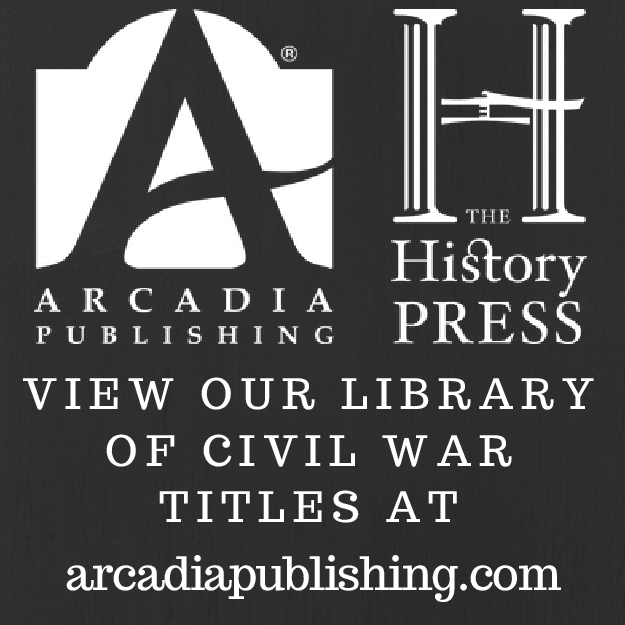 The Artillery Service in the War of the Rebellion, 1861-65 is an important contribution that belongs on the shelves of all Civil War military history library collections. ...my review of this book is BY FAR my most frequently visited blog page. I cut mish-mash Civil War county histories a lot of slack on this site and do have a high degree of affection for them in general, but I am always a bit disappointed that so many truly great books I feature here get search hit numbers negligible in comparison. 1. The 47th Indiana Volunteer Infantry: A Civil War History by David Williamson (McFarland, 2011). This is a massive and minutely detailed regimental history and roster of the 47th, which fought in western theater campaigns for Island No. 10, Helena, Vicksburg, Mobile, and post-war Texas. 2. The Press Covers the Invasion of Arkansas, 1862: Vol. 1 January-June by H.L. Hanna (Createspace, 2011). Eventually, there will be two volumes of newspaper article articles from Hanna plus a later narrative history of Curtis's 1862 invasion of Arkansas. Volume 1 is comprised of northern and southern press clippings covering the period from the Battle of Pea Ridge through the Union occupation of Helena. 3. Diverging Loyalties: Baptists in Middle Georgia During the Civil War by Bruce T. Gourley (Mercer UP, 2011). Gourley, history professor and editor of two Baptist journals as well as a Baptist history, here takes on the traditional portrayal of white southern Baptists as rock solid Confederates. At this point, I would hope that no one holds the notion that any segment of the southern population was monolithic in political loyalty, but Gourley dutifully demonstrates that Baptist views ran the whole spectrum. It was inevitable that the subject of environmental issues associated with the Civil War would emerge in the literature. Late 2010 saw Kelby Ouchley's Flora and Fauna of the Civil War: An Environmental Reference Guide (LSU), which I unfortunately never had the opportunity to read. This spring, University of Georgia Press will publish a pair of studies, Lisa Brady's War upon the Land: Military Strategy and the Transformation of Southern Landscapes during the American Civil War (April) and Ruin Nation: Destruction and the American Civil War by Megan Kate Nelson (May). Though small in population, the Ozark town of Springfield was arguably the most important strategic point in southwest Missouri during the Civil War years. A few minor works have been published, but Larry Wood's Civil War Springfield is the first full length examination of the town's physical sufferings and importance as a base of operations for both sides. At the beginning of the war, home guard companies were raised in Springfield to defend the town from secessionist threats and assist the approaching Union army of General Nathaniel Lyon. By mid-July, Lyon had consolidated the commands of Franz Sigel, Thomas Sweeny, and Samuel Sturgis in camps around Springfield. In August, the town became a hospital for the wounded from Wilson's Creek. With Lyon dead and their army defeated, the federals withdrew, leaving Springfield open to the Confederates, who entered the streets of the town on the 11th. Two months later, the advance of a massive Union army, commanded by John C. Fremont and bent on evicting the Missouri State Guard and their Confederate allies from the state, recaptured the town. However, the Union army was soon broken up, its divisions distributed elsewhere, and Sterling Price's Missouri command reentered an abandoned Springfield and set up winter camps. This situation did not last either, as the Missourians were forced out for good by Samuel Curtis's Union Army of the Southwest in February 1862. Though Springfield did not change hands as many times as Winchester, Virginia, property losses were significant. The two most prominent military events associated with Springfield, Zagonyi's Charge (October 25, 1861) and the Battle of Springfield (January 8, 1863), are ably described in the text. In fact, Wood's map and narrative account of the clash between Zagonyi's battalion-sized advance force and the defending Missouri State Guardsmen arguably affords the clearest understanding yet of what occurred in that enclosed field outside Springfield. Though naturally not as rich in minutiae as Frederick Goman's book length history, Wood's overview of the Battle of Springfield [sometimes called the Second Battle of Springfield, "Zagonyi's Charge" being the first] is satisfactorily detailed for a general work of this scope. While a full rendering of the social makeup of the town is not offered in Civil War Springfield, Wood makes it clear to readers that the population boasted a substantial pro-Union majority. Profiles of several prominent members of the community are included, their trials and tribulations traced throughout the war years. A point well worthy of further development involved local political party alignment. Springfield underwent a radical political transformation during the war, from Lincoln polling a distant last in the 1860 election to a landslide victory for the Republicans in 1864. The author posits several plausible explanations for this, from the gradual driving out of secessionists to economic self-interest (under Union occupation, the town generally prospered in the second half of the war). Short chapters at the end of the book cover the war's aftermath and how the community commemorated the conflict. My only problem with Civil War Springfield was Wood's decision to forgo footnotes. The bibliography, which contains a number of manuscript collections and obscure published sources, indicates diligent research was done, but documenting the text itself would have been helpful. Even with this flaw, the book is easily the best available history of Springfield's Civil War. Richard McCaslin's biography of John S. "Rip" Ford has won the 2011 A.M. Pate, Jr. Award. Fighting Stock: John S. "Rip" Ford of Texas (TCU Press) is a very worthy winner. Why I think so is clear from my review. Much thanks to the Fort Worth Civil War Roundtable for their continued and generous support of scholarly Trans-Mississippi publishing. A while back (within two years, I believe it was an issue or two after the magazine came back from hiatus), there was a North & South article about some battles around Charleston. 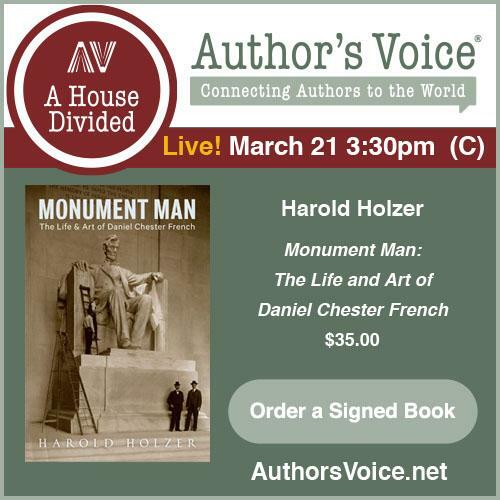 The author bio mentioned the writer was working on a history of the Department of the South. I lost my note on it. Can anyone with back issues handy help me out with the author's name, school affiliation, etc.? Thanks!